During the time of the Inquisition of the Middle Ages, it was believed that the Devil placed upon his human brides, the witches, a special mark that was insensitive to pain. Because it was supposed that such a mark might be well hidden somewhere on the witch's body, one of the first of the many degrading and painful ordeals of the Inquisition began when the accused woman was turned over to the torturers to have her body shaved in search of the "Devil's Mark." Once the alleged spot—which could well have been a mole or a birthmark—was found, the torturers would insert long, sharp pins into the victim's flesh or sear the mark with red-hot branding irons in order to test its resistance to pain. The fact that the suspected area gave no indication of being immune to pain did nothing to absolve the woman accused of witchcraft from later being burned at the stake. the best methods of operating against its menace. They perceived the witches as making use of their unholy alliance with Satan to corrupt the generative powers of humankind. In addition, they believed that witches sought to depopulate Christendom by demanding the sacrifice of children and babies. 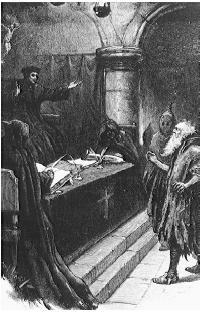 The tribunal judges of the Inquisition examined, tried, and tortured female witches over male witches at a ratio of (depending upon the authority) 10 to 1, 100 to 1, or 10,000 to 1. And beginning with the brutal search for the Devil's Mark, the inquisitors directed their tortures toward the private parts of the body. Once a woman accused of witchcraft found herself in prison through the testimonies of witnesses who had seen her alleged evil powers at work (these could be a neighbor woman jealous of her beauty, a suitor disappointed at her rejection of his love, a relative who sought her share of an inheritance), she was often as good as condemned. At the height of the witch hunt mania, an accusation was the equivalent of guilt in the eyes of judges. And few lawyers would dare defend an accused witch for fear that he would himself be accused of witchcraft or heresy if he pled her case too well. The common justice of the Inquisition demanded that a witch should not be condemned to death unless she convict herself by her own confession. Therefore, the judges had no choice other than to order her to be examined for the Devil's Mark and to turn her over to the torturers to extract a confession from her. In a bizarre rationalization and paradox of justice, the law insisted that the tribunal could not use torture to wring a confession from an accused witch, so they turned her over to black-hooded torturers to burn, stretch, starve, and beat her until she confessed. Once this confession had been accomplished, the accused was made to stand once again before the judges (usually standing of one's own volition was impossible at this stage, so the woman was supported by priests) and confess of her "own free will without torture." Once the confession was properly recorded, the victim of the Inquisition would be led directly from the courtroom to be burned at the stake. it on the Index Librorum Prohibitorum. illusion that it had been granted approval. The most successful superstitions are based on half-truths.